Locked out of Acer computer – I can’t remember Windows 7 password? I can’t reset password online as the old password is still required to log into the computer. Also, I did not have a password hint. I can’t reinstall my computer for important files. What should I do now? Step 1. Get a Windows 7 installation disc or any bootable media that can support us access to Command Prompt. If we don’t have one, go to another available Windows 7 computer and create a System Repair disc by pressing the WinLogo+R keys and run RECDISC. Just keep it blank and confirm it. If you see the message “The command completed successfully”, close the Command Prompt. You should now be able to log in to the account without a password. Just burn it to a CD or create a bootable flash drive and boot from one of them. Step 2. Burn the iSO image file to a blank CD/DVD/USB Flash Driver to create a password reset disk. Step 3.Set locked Acer Windows 7 computer start from burned disk after BIOSO setting. 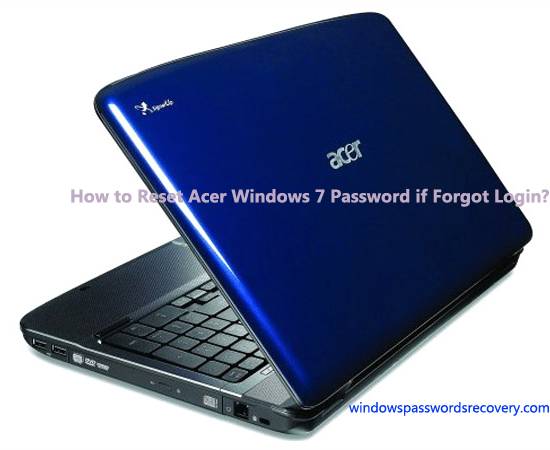 Then restart Acer computer, reset Windows 7 password within clicks. Get related articles on How to Change Windows 7 Admin Password? This entry was posted in Reset Acer Windows 7 Password and tagged Acer Windows 7 Password Reset, Forgot Acer Winodws 7 password, Recover Acer Windows 7 Password, Reset Acer Windows 7 Password, Reset Password on Acer Windows 7 on September 24, 2013 by James.